This 3 piece travel mug set makes a great companion on the road or at the office! Set includes two 14 ounce travel mugs and a 500 milliliter thermos that stows away in a bonus zippered carry case. 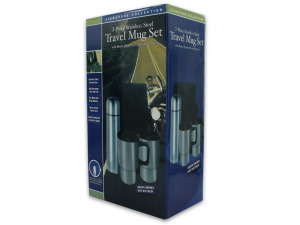 Each mug features durable stainless steel construction and locking spill-resistant tops. Perfect for keeping beverages hot or cold for up to three hours. Fully closeable thermos stores more of your favorite beverage and holds temperature for up to nine hours. All three pieces fit conveniently in the zippered carrying case with an adjustable handle. Items is packaged in an individual box. The thermos is 9 3/4" tall and the mugs are 5 6/8" high.